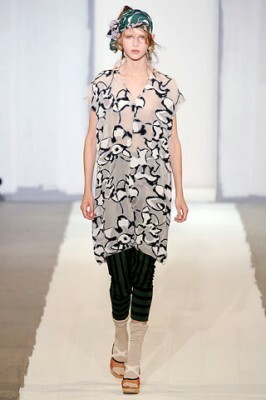 Springtime at Marni is totally putting me in mind of Mary Tyler Moore’s infamous neighbor, Rhoda Morgenstern! 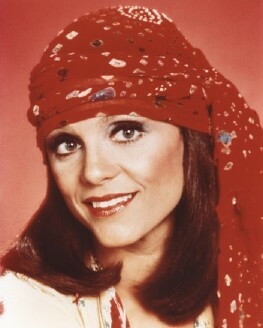 Being a girl who almost always describes herself as “Rhoda, 2009″, this is making me VERRRRY happy. 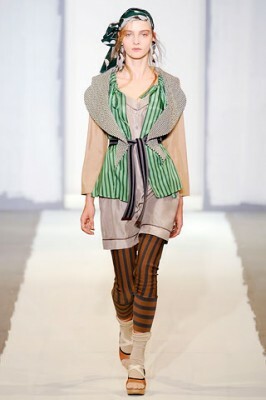 The collection exudes all the eccentricity and comfort that Ms. Morgenstern herself always did (not to mention her signature head scarf), and even though the designer could’ve been inspired by anything else for all I know (yeah whatever), one thing’s for absolute certain- if Rhoda were around today, she would LIVE in this collection! I really like your website. Thanks so much, finally a decent website with good information in it. I cant make head or tail of Life. Love is a fine thing Art is a fine thing Nature is a fine thing but the average human mind and spirit are confusing beyond measure. Sometimes I think that all our learning is the little learning of the maxim. To laugh at a Roman awestricken in a sacred grove is to laugh at something today. After study a few of the articles on your website these few days, and I really like your way of blogging. I added it to my bookmark website list and will be checking back soon. Please check out my site as well and let me know what you think. A really useful publish by you my buddy. We have got bookmarked this web web page and may could be found as soon as more following a lot of days to examine for practically any new posts that you just just make. Hi from Spain! Can I quote a submit as part of your blog with the link to you? I’ve tried contacting you regarding this issue but it seems i cant achieve you, please response when get a time, thanks. This post was very nicely written, and it also contains many useful facts. I enjoyed your distinguished way of writing this post. Thanks, you have made it very easy for me to understand. Your details are very good; we got new knowledge from your site. Template also very good, color matching is well. I will keep visiting your site often. This is a great article thanks for sharing this information. Give your knowledge for all people. Because who likes to know more information. I saved some details to me. Do you have any other similar blogs and/or related fields of expression. This information has caused in me some quasi-cascade effect that has resulted in a great rearangement of my knowledge almost akin to a complete paradigm shift in the way I perceive the world. Thank you so much for this and I bet you wil accumulate a ton of Karma and positive chi due to your wonderful undertaking in this blog! Hi there, I found your website from Bing. As a roofing contractor I like your article, I think it is very informative, made me thinking.. I already bookmarked your website and will revisit your website again, please keep up your good job. Thanks!